There’s no doubt about it, if you knew when equipment components were going to fail you could avoid costly downtime; you wouldn’t lose valuable production time, and you could better control the costs of repairs. Or what if you could identify the exact conditions in your project plan that were the most likely to cause accidents? You could take corrective actions and proactively manage risk for your people and your project. A future like this is waiting in your data. Predictive analysis uses automation to look for meaningful relationships across sets of data and then make value-based recommendations for the actions to be taken when events occur. It isn’t science fiction, it’s here. 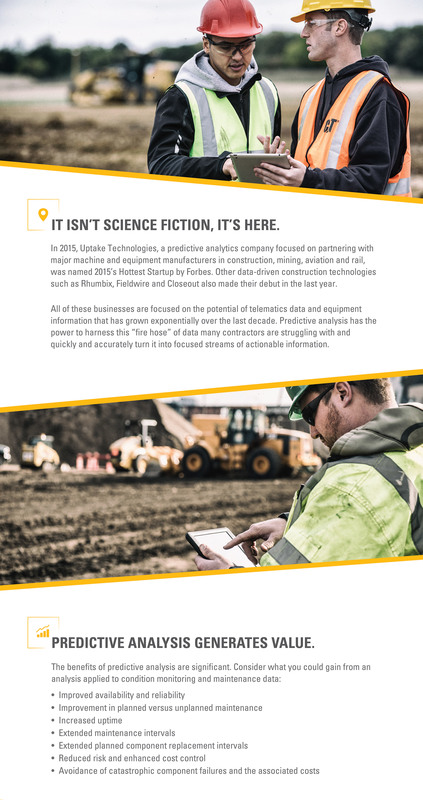 In 2015, Uptake Technologies, a predictive analytics company focused on partnering with major machine and equipment manufacturers in construction, mining, aviation and rail, was named 2015’s Hottest Startup by Forbes. Other data-driven construction technologies such as Rhumbix, Fieldwire and Closeout also made their debut in the last year. All of these businesses are focused on the potential of telematics data and equipment information that has grown exponentially over the last decade. Predictive analysis has the power to harness this “fire hose” of data many contractors are struggling with and quickly and accurately turn it into focused streams of actionable information. Predictive analysis adds to safety. 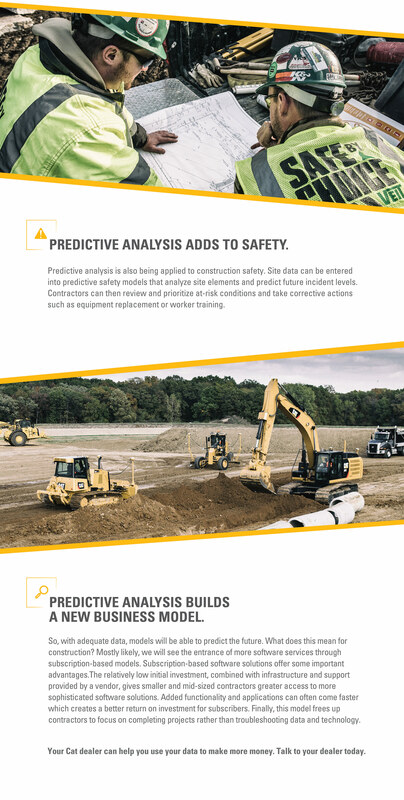 Predictive analysis is also being applied to construction safety. Site data can be entered into predictive safety models that analyze site elements and predict future incident levels. Contractors can then review and prioritize at-risk conditions and take corrective actions such as equipment replacement or worker training. Predictive analysis builds a new business model. So, with adequate data, models will be able to predict the future. What does this mean for construction? Mostly likely, we will see the entrance of more software services through subscription-based models. Subscription-based software solutions offer some important advantages. The relatively low initial investment, combined with infrastructure and support provided by a vendor, gives smaller and mid-sized contractors greater access to more sophisticated software solutions. Added functionality and applications can often come faster which creates a better return on investment for subscribers. Finally, this model frees up contractors to focus on completing projects rather than troubleshooting data and technology. Your Cat dealer can help you use your data to make more money. Talk to your dealer today.